The Aston Martin is back! It’s been 50 years since James Bond first appeared on cinema screens in Dr. No, and he and the franchise have gone through many permutations, from the bombastic to the farcical, with farcical probably just outweighing the bombastic. Skyfall teeters on the tightrope between these two adjectives, at times threatening to fall embarrassingly on its arse in the farce camp. Not that this is necessarily a bad thing. No-one goes to a Bond film for gritty reality. The plot is loosely based around the stealing, by cyber criminals, of a hard-drive which contains details of all undercover operatives in terrorist groups around the world, but by the end the recovery of the hard-drive is forgotten as the threat against Bond and M turns much more personal. The film is really about Bond and M’s relationship, and so Judi Dench, whose hair becomes more ethereal which each movie, gets a lot of screen time. This means there are quite a few scenes set at MI6 and other bureaucratic offices, as M spars with Whitehall mandarin Ralf Fiennes and even appears at a Select Committee. Unfortunately I couldn’t help thinking of Brit comedy series The Thick of It, and expected Malcolm Tucker to burst in at any moment to tell M what a waste of skin she was. But there is plenty of field action too, and one thing this film really excels at is the breathtaking locations as Bond careers through hectic Istanbul, night time Shanghai and glittering Macau before coming home to London, which seems a little drab in comparison. 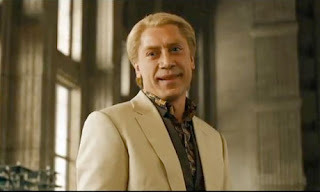 Daniel Craig puts in a good performance and copes well with the camera’s insistence on gratuitously focusing on his six-pack, but he is much upstaged by Bond Villain Javier Bardem, who surely must out-camp every other Bond Villain brought to the screen, quite an achievement. And what of the Bond Girl? Bond doesn’t really get much of it in this film, in fact the most tense sexual scenes are with Bardem. Out-camping every other Bond baddie, Javier Bardem. 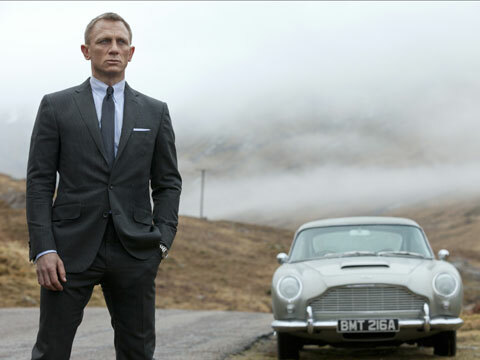 Whilst Casino Royale and the forgettable Quantum of Solace seemed to wish to distance themselves from their predecessors, Skyfall embraces the past, bringing back the Aston Martin and a few other old friends, suggesting a new direction for future films. It doesn’t quite have the swagger of Casino Royale, but as Bond films go, Skyfall is a hugely entertaining two-and-a-half-hour romp.